How do I apply it to my photography? Is there a time when I should consider using it over other composition methods such as the Rule of Thirds, The Golden Ratio, or the Diagonal Method? Bakker's Saddle is a guide, much like the Rule of Thirds, about where to put the subject of your image. Draw a line diagonally from one corner to the opposite corner. 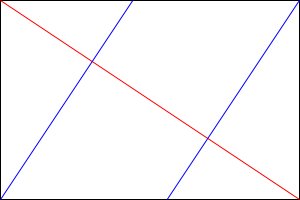 Next, draw lines perpendicular to the diagonal that intersect with the other two corners. Place your subject at one of these two intersections. While the way I have drawn these places the power points near the top left and bottom right, you could reverse this and put your subject near the top right or bottom left. I might actually prefer something closer to Bakker's Saddle over the Rule of Thirds if I were placing a person in a wide landscape shot — the Rule of Thirds would leave an awkward amount of space between the person and the edge of the frame. Remember that Bakker's Saddle, the Rule of Thirds, the Golden Ratio, etc. are all guidelines, not hard and fast rules. They can be good suggestions for where to put your subject in the frame, but they won't necessarily make a good picture, nor will your picture necessarily be bad if you ignore these rules. It was named after, and possibly invented by, illustrator and photographer Gerhard Bakker, who lived from 1906–1988, and worked an artist and a teacher of photography. It is possible that the rule includes the idea of different meanings for the four different points created at the various intersections. However, I'm going to need to do a bit more research on that; it may be something added after. Not the answer you're looking for? Browse other questions tagged composition composition-basics or ask your own question. What is the “Rule of Thirds”? What are other popular composition techniques in addition to The Rule of Thirds? What is headroom as it relates to photographic composition? What are connotations of horizontal and vertical lines in composition? What is the “visual center” of an image? If viewers don't respond to the rule of thirds, why do some photographers still emphasize it? What is the Rule of Equiangular Spiral Grid?